− Fast, duo-cure polymer type textile printing screen process emulsion with separate diazo sensitizer powder, for aqueous ink systems. − Light purple color with excellent see-through. − The ready-made stencil can be post-hardened by light to increase the mechanical and the solvent resistance. − Very short exposure time. − Medium viscosity, appropriate for meshes between 45 T and 120 T (lower viscosity than FOTECOAT 1065 and a higher viscosity than FOTECOAT 1636). 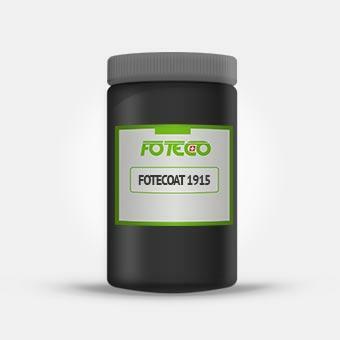 − FOTECOAT 1915 WR is a water resistant emulsion that can be printed with most inks containing water and little solvents. − A longer exposure renders the stencil more resistant against abrasion and therefore allows to print longer runs. − FOTECOAT 1915 WR can be decoated. − If a permanent stencil for all inks is desired a longer post-hardening by light or a chemical treatment with FOTECHEM 2110 or 2100 Hardener can be used. In such a case the stencil can no longer be decoated. Because of the relatively high viscosity of FOTECOAT 1915 WR it is recommended to degas the emulsion after sensitizing during a few hours. FOTECOAT 1915 WR is ideal for machine coating. If necessary, the emulsion can be diluted with water to reach a lower viscosity. − The definition is excellent. The high solids content allows to reach a flat stencil surface combined with excellent mesh bridging. − The resolution is good. 5 KW metal halide lamp at 100 cm distance; iron charged high pressure burner at 100 hours burning time. − Only possible with high pressure gun. − A higher concentrated remover than usual has to be used. Ideal are FOTECHEM 2004 liquid or FOTECHEM 2005 paste. − For machine decoating the concentration of the remover liquid has to be increased and the speed of the machine be reduced to a minimum. − A post-exposure makes the stencil removal easier. Once the stencil is washed-out and dryed it can be exposed again under the sun, day light fluorescent tubes or with the standard exposure lamp; it is recommended to make the post-exposure without the vacuum frame so that no glass between the lamp and the stencil interferes with light absorption.